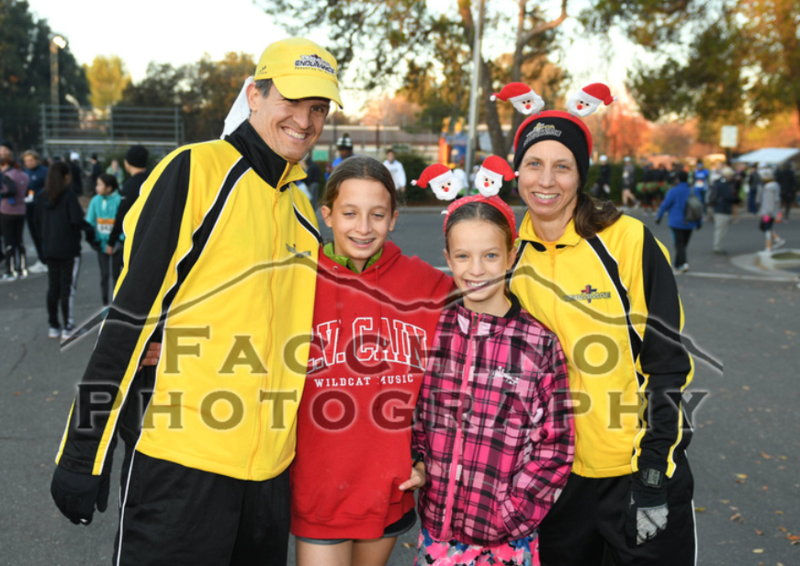 We’re running the Davis Turkey Trot.. and it’s December. 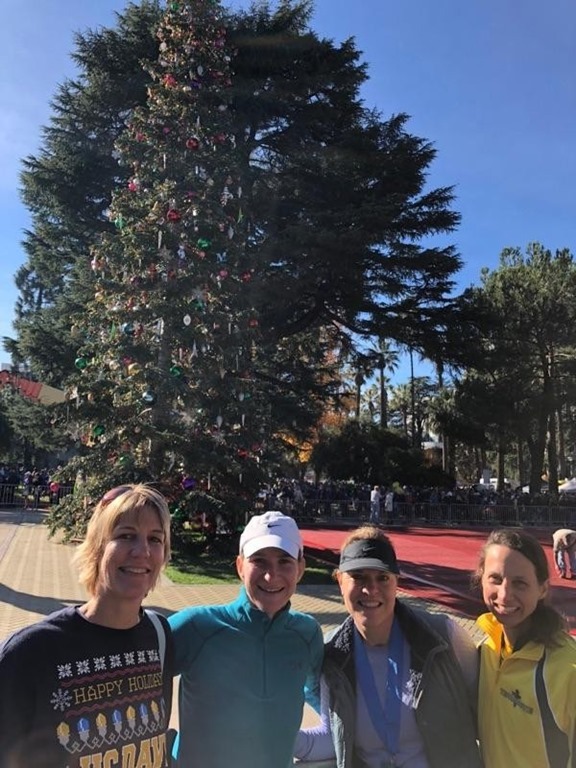 The race was postponed due to the bad air quality from the Camp Fire. Though we are tired from the CIM relay and a busy week, it’s still fun to come back to my old college town for a race. 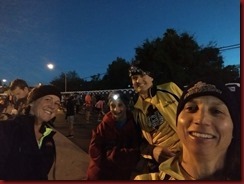 Ariel and I are doing the 5K at 8am and Troy and Anna are doing the 10K at 8:30am. Troy and Anna may be able to see us finish! I’m going to try to go sub-7 min pace…at least according to my Garmin which isn’t always accurate. I want at least to go faster than my Auburn Stock the Closet 5K! We all pray together and then I move up to the front. I look back at Ariel and wave. We are both wearing Santa headbands. I have mine tilted down so it won’t fly off. Ready, set, go! I quickly get off the line. I feel great starting off and am surprised my watch says I’m going under 6:30 pace. Better dial that back some. Pretty soon, I’m barely able to hold sub 7. I see a gal in yellow that I hope to catch up to later. For now, I’m sticking with this pace. Mile 1 is about 6:57 according to my watch. We go under Covell Blvd and I see someone running through the neighborhood towards me. As he gets closer, I realize that it’s Justin, a kid I used to coach in Davis. He’s not a kid anymore…he’s married with kiddos. By the time I realize it, it’s too late to say anything. Maybe I’ll see him at the finish. I’m over 7 min pace and feeling a bit tired. I remind myself that it’s a short race. I’m now heading back towards the finish. Mile 2 puts me at about 7:03 pace average. I no longer see the girl in yellow. There are a few girls to catch, though. It’s up the “hill” (a short overpass over Covell Blvd) and back down. I push the downhill hard knowing that I need every advantage I can get! I pass a girl going through the park and by Davis High School. I am really having to dig deep now. Just got to hold on a bit more! Now I’m on B St. heading home. It’s the longest stretch of road it seems. There are 2 boys running right with me. Part of me selfishly wants to just go by and say nothing…but the joy of the Lord presses me to encourage them. “Great job! Push it! The finish is close!” One takes off and I try to go with him. I can tell the other boy is trying to push too. It’s such a long way but the 3 of us pass some others and stay steady. I want to break 22 min, sub 7 min, but I can tell coming in I’m just shy. I dig deep and finish as fast as I can. Wow, thank you Lord! I went faster today and felt joy. Now it’s time to cheer in Ariel. 10, 9, …, 3, 2, 1, Go!! I start running. As I cross the starting point, I feel like my Santa headband is falling off. I try to rearrange it but it keeps falling off. I take it off and carry it while I run. “Oh no!” I think “I didn’t start my Garmin,” I turn on my Garmin. There are 2 girls in very Christmassy outfits. I keep trying to stay behind someone but if I am not paying attention enough, I lose them. So, I think in my head “did I pass her or is she way ahead?” “Did I pass him or is he way ahead of me?” A guy with a nice-looking suit with Christmas lights patterns is ahead of me. I keep running straight and then go over a bridge. I remember that Dad told me that there was going to be an aid station so I was wondering when and where it’s going to be. When I get off the bridge, I see an aid station. 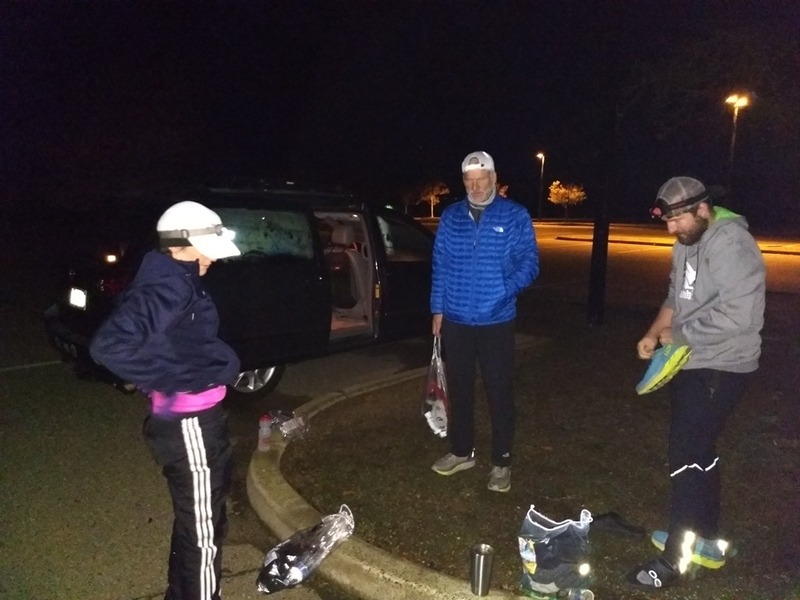 There is one thing different about this aid station, there is nobody at the aid station and all the cups are still in their bags. It looks like the race is later in the day. I am surprised that nobody is there and also because I thought that there was going to be an aid station around now. Then we run by a little park. I keep looking at my watch to see if I was ahead of time. One time, I am behind so I speed up. I look at my Garmin and think it is right. It says I am at 2.4 miles. I look up and see the finish line then I remember I started my Garmin late. I start running faster and I am looking for mom. She said she would run back to see me when she finished. I see mom and she says to sprint because someone is behind me. Without looking back, I sprint to the finish line. I got 3rd and my time was 27:34.64. 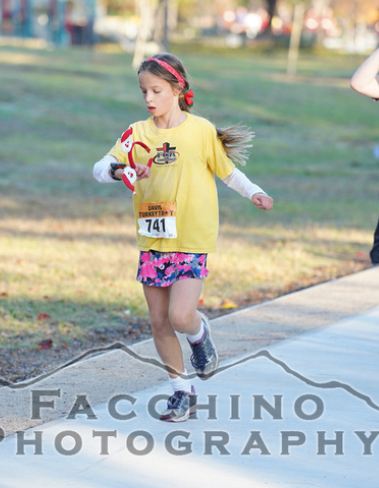 1st out of 2 (12-13yrs), 4th Woman Overall! 3,2,1 Go! I start to run. I am feeling great. My goal is to keep a 7:10 minute pace. I am running with my Dad. He will probably take off though because he wants to keep a 7:00 minute pace. We turn a corner and my Dad starts to take off. I see a girl up ahead and think it is someone in my age group. After a while I finally catch her and find out she is an adult. We go under a bridge. It is pretty small bridge but it's cool. We keep running and get on to a concrete sidewalk. My feet are starting to hurt and I can't wait until we stop running on the side walk. We run for about a half a mile. After a half a mile we run behind some houses and there is a small dirt path on the side of the concrete. I run on the dirt path to give my feet a break. There are some plants on the side of the dirt path that have some dew on them. When I brush past them, it seems to refresh my legs. I stay on the dirt path for a little bit hoping that it wouldn't slow down my time. I run on the sidewalk for another half a mile. I can see a lot of farm land next to us. After the half mile, I see an aid station up ahead. I run towards it. We are now allowed to run on the road. I also see two big signs that point 10K one way and half marathon the other way. I grab water and turn to go on the 10k path. Shortly after turning I hear two guys say "Oh shoot. This is the 10k not the half." They run back out to go over to the half course. I am running behind the houses on a secret trail. We come out onto the street. We run a little on the street before going into another secret trail. We run through the park. My feet and calves are starting to hurt. After running through the park, we run onto the road for about 10 seconds before going into another secret pathway. Running on the secret pathways are fun. It is shady too. We soon run back on to the road. But it is only for 20 to 30 seconds before going into another secret pathway. The pathway is only 20 seconds before we are back on the road again. We run on road for a while. I see a park up ahead and we run into it. It is nice and peaceful in the park. There are people walking but otherwise it is not really crowded. My calves start to hurt worse now and my feet start to hurt bad too. I wonder if I shouldn't have worn my new shoes. I see a bridge up ahead and a camera man. I run by and smile. The bridge is fun to run across. I imagine what might happen if the bridge collapsed. I am glad that God didn't let it break right then. At the bottom of the hill I make a sharp turn. We are running in a park again. There is an aid station but they aren’t giving out water. I think that they are probably waiting for the half marathoners. While running through the park, a bike seemed to be following me. I don't know if the person wants to pass or not. I move to the side for a little bit but they don't pass. I turn and I think the bike kept going forward. I am now back on road. My calves are hurting really bad and so are my feet. I have to just keep saying God is with me over and over again. I just keep running straight. After a while, I can see the finish far up ahead. I run towards it but seems like it’s not getting closer. Finally, I get closer. I can now see my sister and mom waiting for me. I look behind me and then at the finish. I start to run down the long finish shoot. Ariel shouts “sprint Anna sprint!” I start to pick up the pace. When I get really close, I sprint in. I point to God as I finish. I couldn't have done it without him. Praise the Lord I got my time to even though I was hurting. Praise the Lord for He Is Good His Love Endures Forever. Anna & I are running the 10k.. right after we see Robin & Ariel off on the 5k. 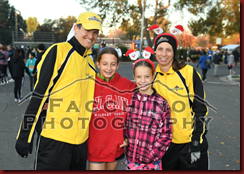 This is really fun coming to Davis and doing a family run together. I look forward to opportunities to either bump into familiar faces or meet new people. 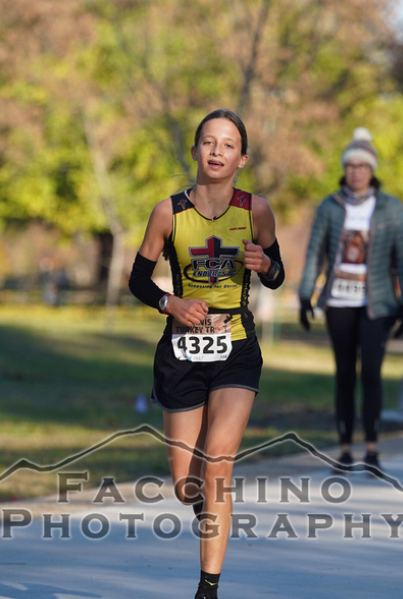 In all our hope is to display a joy of running rather than the stress or self-centeredness that can plague competitive events. “A Change of Pace” is a great race organization and they make these Davis runs really enjoyable. 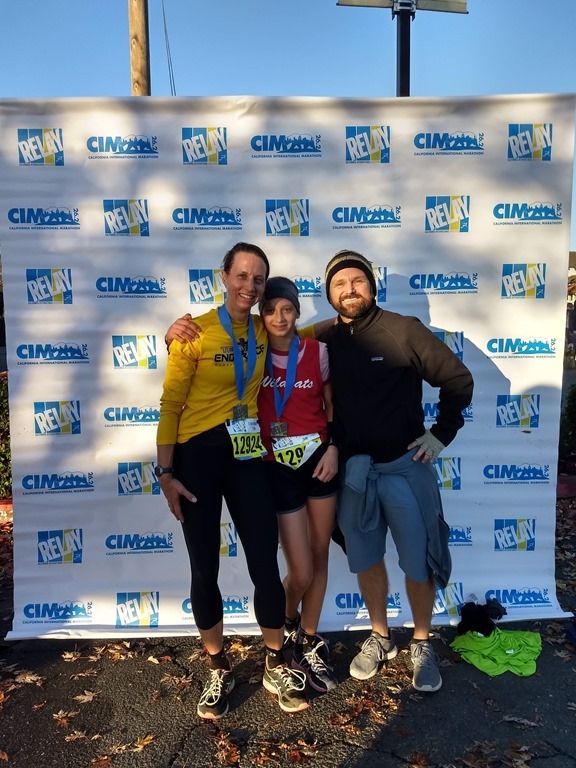 It’s a family atmosphere with plenty of fun and goodies afterwards and I always love the routes. They’re often different, exploring the many greeneries and exercise paths around Davis. They’re always sure to have many twists, turns and tunnels to keep you guessing where you are at. We reunite with Justin Morejohn. I talk to a guy with those orange Nike shoes that everyone at CIM was wearing. He gives me the scoop about the secret re-bound insole promising 4% increased energy/speed. So that’s what the hype is all about. We pray together and then watch Robin & Ariel take off in the 5k! We’re actually able to see Robin finish before Anna & I start our 10k. 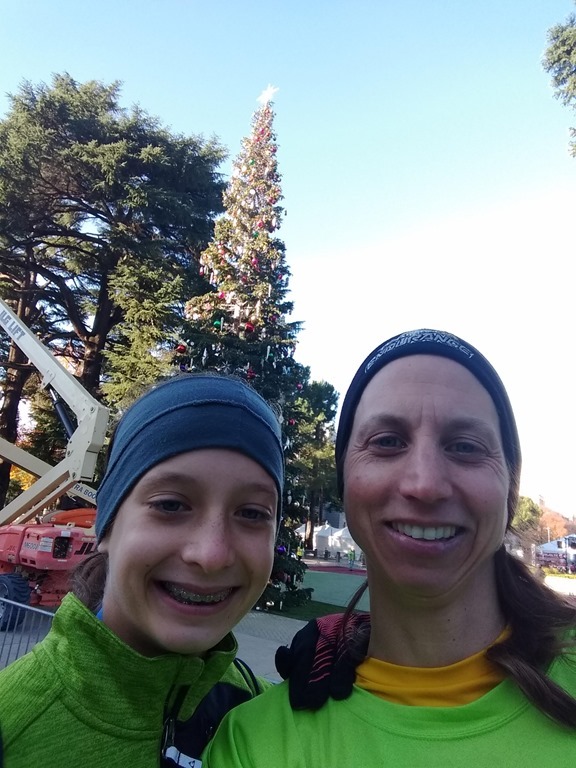 My goal is sub-7 pace and Anna is trying for 7:10 pace, the same as her CIM relay leg. I still have the rt. heel pain but it shouldn’t bother me much. Go! Starting out always feels so good. Plenty of energy but have to remind myself not to go too fast. Anna is just behind me and I hope she’ll stick to her pace rather than go for it and try to stay with me. She probably could, but she ran hard last week, has another relay event next week, and is feeling a little run down. I notice only 8 women ahead of Anna. Although I don’t know if they’re in the 10k or the 1/2 marathon, I feel like Anna’s going to place well at the pace she’s planning. Mile 1: 6:47. A little fast. The temp is cool. Perfect. We’re on a new route for me. We circle The Cannery – a mixed-use develpment of residences, commerical space and a lot of parks and open space. Mile 2: 6:56. Along The Cannery, Anna is farther back now, hard to see. But as we turn to climb the W. Covell Blvd bridge I can see her, “Good job, Anna, good pace.” Up and then down the exit ramp. Mile 3: 6:50. Now it’s a long straight stretch down F. St. Towards the end, I see signs ahead indicating a split for the 10k and 1/2 Marathon. First I go through the aid stations and have trouble finding just water. It’s not until the very last hand-off that I finally get a cup, chug it and then see a sign for a hard left turn. What I didn’t see was the first left turn sign for the 10k right at the end of the aid station. I’m on a dirt trail now which is cool because you’re expecting concrete. Mile 4: 6:59. I’m amazed at this dirt trail along a canal which I’ve never seen before even though we’ve raced in Davis probably 30 times before. I look back but no longer see Anna. My pace is good. I figure we must start heading back since there’s only 2 miles left and we’re far from the start. Mile 5: 6:58. Running towards a hwy I’m expecting a hard left and a direct shot to the finish. As I get closer I see people directed to the right instead! Immediately I realize that I’m in the wrong race. This is the 1/2 marathon. I made a wrong turn. I turn around and head back and others, also realizing their mistake, turn and join me. I realize now that Anna went the right way and that’s why I didn’t see her anymore. Ha, her slower pace is going to be the victorious one today! About 4 of us group up and try to keep our pace despite knowing it’s going to be longer than we expected. We see course markings heading in the direction of the finish so we follow them. Mile 6: 7:23. Lost some time due to the turn-around and confusion, but trying to keep the pace up. My goal is to meet my sub-7 goal no matter how long the race turns out to be. We run through pretty greenways, under tunnels, through parks. Then the course heads out again (it’s the 1/2 marathon course still) but we continue straight, completely off-course now. A woman in our group knows these paths and says we’re on the right track. Sure enough, we see the 10k racers up ahead and merge in with them at the official 5mi mark. Mile 7: 7:11. Ok, I’m exactly 2miles behind but the good news is the overall pace is just a little over 7min/mile. [I’m also currently in 8th place in my age group]. I try to pick it up even though I’m feeling some fatigue now. Over a bridge, through another park, and it’s starting to look familiar. It’s a straight shot to the finish now! Mile 8: 6:52. Great! I’m under 7min/mi pace. But I’ve been wondering about Anna and if she’s concerned about me not being at the finish. She’s been done for a while now and I hope she’s not worried. Then I hear her up ahead calmly cheering me, “All right, Dad, you’re getting extra credit today, keep it up..” Ha, she’s more aware of what’s going on than I am. 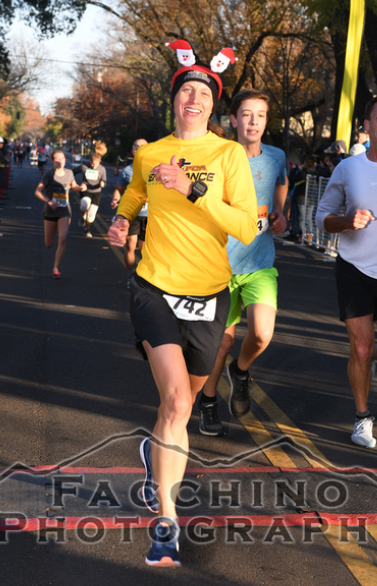 I keep pushing hard and, without realizing it, I pass 3 guys in my age group! Mile 8.2: 6:01. I finish with a big push and a smile. I’m really happy with my run, especially since I went farther than I thought I could after a hard effort last week. Thank you, Lord, for giving me a joy despite a mistake that could easily have bummed someone out. It’s really about the effort and not the success. 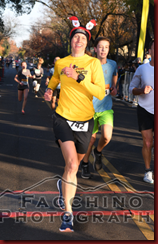 Surprisingly, I still got 5th in my age group, finishing in 57:19. 5 in my age group finished within a minute of each other. Another reminder to me to keep pushing no matter what happens in a race. A really fun day for all of us. At the start of the CIM I am so excited. They are so many people there. I am by the 3:10 hour group. I hear the gun go off but we don’t move. About a minute and a half later we start to walk towards the start. I am with my parents as we start to jog. As we run over the mat, I hit my Garmin. I am so excited I feel like my heart is going to burst out of my chest. My dad is running with me. I look behind me and blow my mom a kiss as we run off. All I can see ahead of me is people running. Running with my dad is fun. We are trying to keep a 7:10 minute pace. Up ahead I see people turning. My dad tells me to move over. We slowly start to move over for the turn coming up. I feel great. There are people cheering us on less then a mile away from the start. We make the turn and keep running. There are a lot of rolling hills. I see the sign that says 1 mile. I am surprised we have gone that far already. I am feeling good. I see someone behind me wearing shiny gold coloring pants. They are almost like plastic and make a lot of noise when he runs. My dad and I are on pace. I really enjoy running with my Dad. After a while I realize that we are behind our pace by 12 seconds. I’m thinking that we will not be able to catch up, but my Dad says we will try to make up time on the next downhill. He is right. After a while, we make up time and are back on pace. I keep running and see an aid station ahead. I tell my Dad that I’m not thirsty, but he tells me get some water anyway. I grab some water a keep running. After about a half a mile, I start to have a cramp. I use Dad’s tip to fix my cramp without stopping. After running for a while, we see the 3:10 pacer up ahead. There is a huge group with the pacer. We catch up to the group and run with them. It is so cool. There are so many people that it sounds like thunder. After running with the group for a while, I see an aid station up ahead. I grab water and have a little bit of it. I am kind of getting tired but my legs feel fine. We are at about mile 5. I know I am almost done. We pull away from the 3:10 group and run ahead of them. My dad says, “Don’t look back now, but we are being chased by the 3:10 group.” I laugh in my head. I can see a turn up ahead and remember I have a 1 mile left to the finish. As I am running towards the turn, I hear a trumpet. I look around a see a little boy playing one note on a trumpet. It is funny. We get to the turn. I see a drum band playing as we go by. I try to speed up but my legs and feet have started to hurt. I see a girl run past me and I run to catch up to her. I say hi. She asks if I was from California and I said yes. She said she was from Alaska. We grab some water at an aid station and keep running. She runs ahead but I don’t mind. God has given me a great race. I am on my time. I hear a volunteer calling out relays on the right and marathoners on the left. I run to the right towards the exchange. Enzo is there right on time and takes my chip and runs off. The relay went really well. 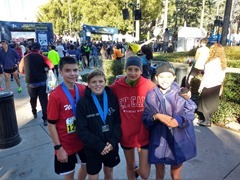 Enzo, Leah, and Hunter ran a great race. We got a time of 3:06:00. Praise the Lord, His Love Endures Forever. 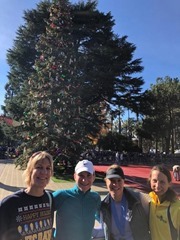 This has been a great tradition, making a team and running the CIM Relay! 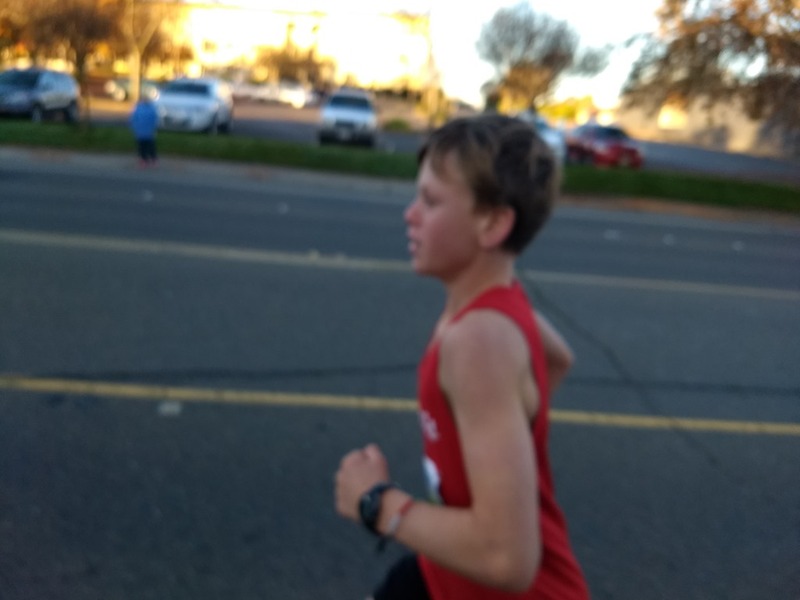 An FCA Endurance running friend from church, Isaac Josifek, has joined me this year as 2-man team. We both didn’t train as much as we wanted but I know it’ll still be a great time. I have more confidence in Isaac than myself but I know I’ll have a ton of motivation because I get to start with Robin and Anna. 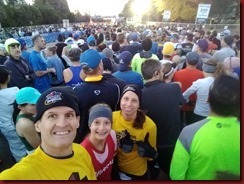 Yes, this is a really cool deal.. the first time ever, 3 of us will be lined up at a major running start! 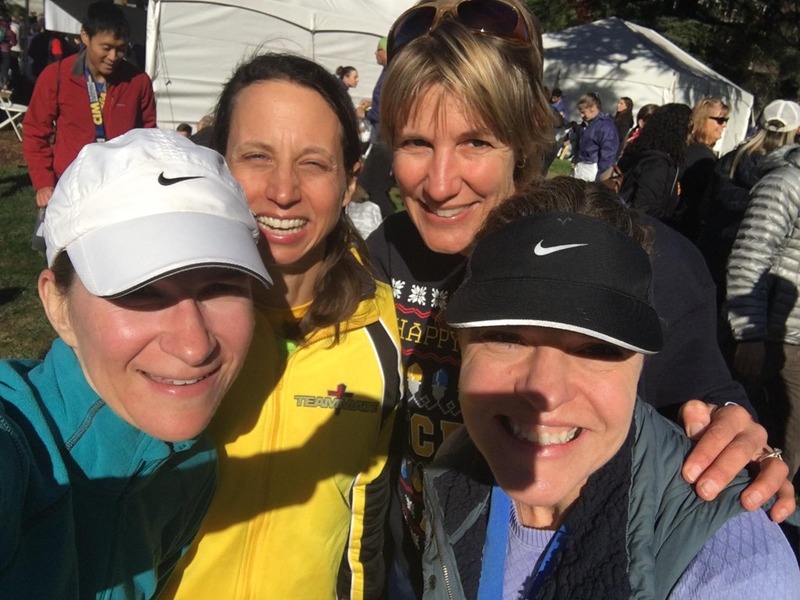 Robin, running with her 4-woman realy team which has a 20 year streak so far! 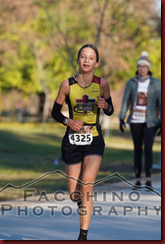 Anna, fullfilling her dream and running with a 4-cross-country-runner team from E.V. Cain Middle School! And me on the FCA Endurance Team. Robin drives us, and 3 marathon friends, to near the start. 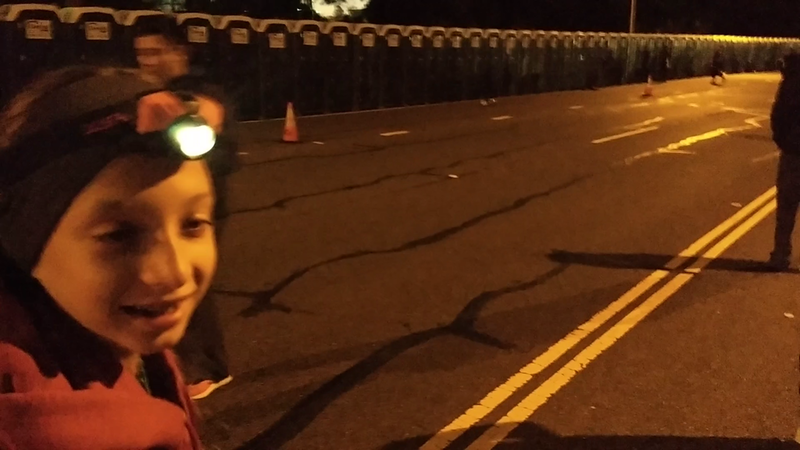 We run through the dark to the staging area and see the never-ending line of porta-potties! This is the largest running field they’ve ever had. After dropping off our warm-up gear (the weather is a little chilly but perfect for running) we go to our corral. After a beautiful trumpet rendition of the National Anthem, we look at each other with total excitement. Anna is full of energy and loving this opportunity. We stop and pray, knowing that none of this is possible or fullfilling without the Lord. We all have so many wonderful memories of God guiding us through big events in ways that make them precious memories. The race starts! And 1-1/2 minutes later we cross the starting line. We’re in the 3:15 wave and yet a whole sea of runners is already ahead of us. Anna and I pull ahead and lovingly say goodbye to Robin. My plan was 7:15 pace but I go 7:10 to keep up with Anna. My rt achilles was really sore warming up. It’s getting better now. Mile 1. 7:13. We start up the first hill. Anna says her knee is hurting a little. Mile 2. 7:24. Thankfully Anna says her knee is feeling better. Mile 3. 6:50. Anna says we’re behind pace by 12 secs so I tell her we’ll make up time on some downhills. Mile 4. 7:05. We’re back on pace and running with the 3:10 pack now. Mile 5. 7:13. We start pulling away from the 3:10 pack. 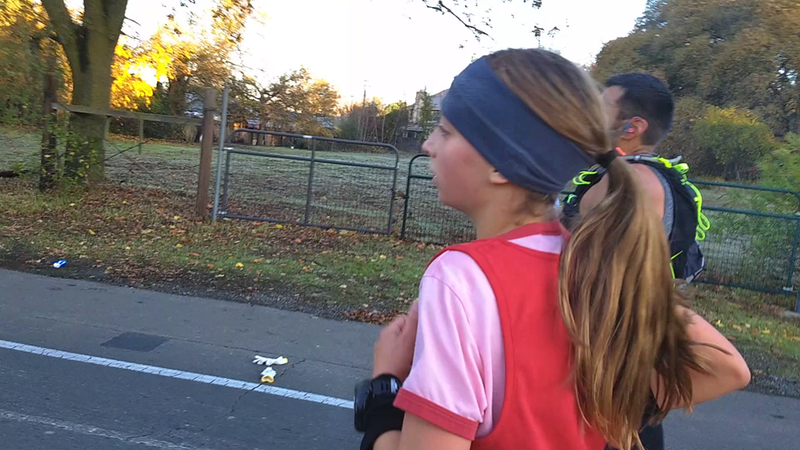 Anna & I are running well, side-by-side, proud Dad moment. Mile 6. 7:07. I tell Anna, “In only 10 min you’ll be handing off to Enzo (her teammate)”. Anna starts to pull away from me. But this is going to work out great. A straight-shot ahead I can see the transition area. Mile 7. 7:01. Anna’s way up ahead. I can see her pull into transition, running past a hundred onlooking relay runners before I see Enzo pop out and exchange the chip. I’m running by as they exchange which gives me a great photo op. I pull ahead but Enzo comes flying out of the exchange and meets right up with me! This is too cool that now I get to keep running with Anna’s team. Enzo’s a great kid, very respectful and a gutzy runner. Mile 8. 6:58. My run is getting harder now, but I’m just excited to help Enzo and his team. I try to sense what pace is good for him. He was planning 7:15, but he seems capable of 7:10. We talk about the pace we want for the next mile. Mile 9. 7:19. I call out our splits each mile and then we adjust. Mile 10. 6:56. After going through my favorite part, the small town with the High School Band playing, I know I’m not going to be able to keep up with Enzo. He pulls ahead and I’m feeling my legs tighten up. I went too fast. I think about how disasterous this would be if I was doing the marathon. Fortunately, I only have 3 miles and, Lord willing, will be just fine. Mile 11. 7:11. A long straight stretch to go. Sometimes I get a glimpse of Enzo’s red shirt far ahead. I’m glad he’s doing so well. I have to make sure I don’t break down for the sake of my team. I try to run smart and use muscles that aren’t hurting as much. Mile 12. 7:26. My pace has dropped. Slowly but surely I’m getting there. I’ve taken off my beenie, gloves, and arm warmers. I’m pretty warm. Mile 13. 7:21. There’s the big “1/2-way” arch! It’s great to see but I’m surprised how far the exchange still is. I always forget the extra 1/2 mile. Finally, I see the exchange. I wanted to take a video of our exchange but I’m so tired I don’t chance it. I need to make sure I hand Isaac my bib and get information where the car is. Where is he? There he is! With a smile he takes the chip and bib and points to where his stuff is and he’s off. Mile 13.4. 7:26 pace. Finished in 1:39:55, 7:24 ave. Wow, so glad to be done! Thank you, Lord, for keeping my legs together, especially my achilles which didn’t hurt much. Isaac ran a great race and finished us in 3:11:34! We ended up 1st in the male 2-man fitness club division. 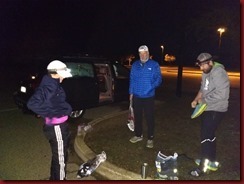 The “Soares Shuttle” to the start is off at 5:30am! This will be the first time ever that Troy and I have run the same leg of the relay. Anna is joining us too! She’s got her own relay team made of her 7th grade cross country teammates. Karen NIckel is joining us too along with pacers Austin and Tim Twietmeyer. This is Austin’s first marathon. But he’s run 100 miles and has experience pacing since he was a kid running with his dad. We park at Beal’s Point and which is less than a mile away from the start. Love this secret spot! Private bathrooms instead of porta-potties! We all head down together. It’s cold out here! Austin and Tim head off to the pacer area. Karen and us get a chance to go the bathroom again but more importantly we get to pray for each other. Karen has had terrible hamstring pain and Troy has had a very sore achillies tendon. We also pray for others like Melissa Penwell and Nicole Lane (friend Lori Bergenstock’s niece). Both gals are elite runners. Our bags full of our warm-up gear are checked. Time to get to a good spot on the starting line. We say goodbye to Karen and head up to the 3:10 pace group. There is no way I can ever run that time but for a relay I can just about do that. I’m hoping for 7:30 pace or faster, Anna is going for 7:10 and Troy somewhere in between. As we are waiting around to start, I point to some bright NIke shoes and say, “wow, those are bright!”. Anna says “they’re everywhere!”. We look around and we can count 20 pairs right next to us. Popular shoe! The crowds are huge this year. I’ve never seen it this packed! After an amazing Star Spangled Banner on trumpet, the race starts. It takes us 2 minutes just to cross the starting line. Wow, usually it’s less than 20 seconds. Anna and Troy are off. 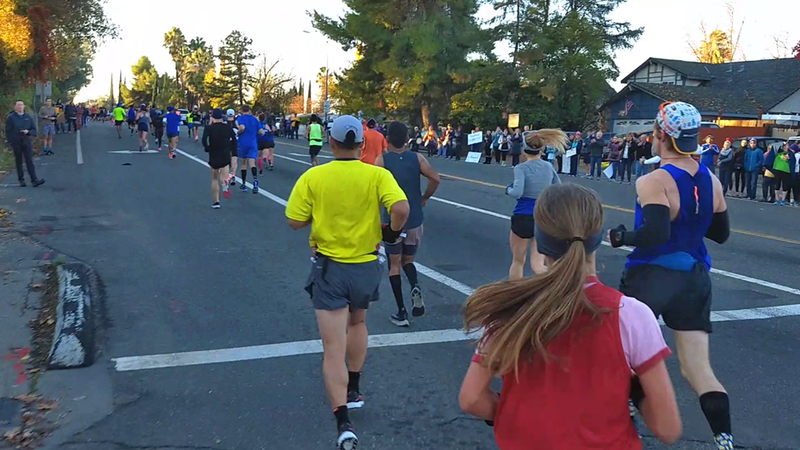 As we run the 0.9 miles down Auburn Folsom to Oak Ave, I can see them the entire time. So grateful that Troy can still keep up. Those days are over for me probably up to the 1/2 marathon distance. I feel comfortable at my 7:30 pace. I hope I can pick it up the last few miles! By the time I turn onto Oak Ave, my core feels pretty warm and have to pull up my sleeves. Gloves and beanie are still needed. At the first mile, I’m averaging 7:30. I can just barely see a glimpse of Troy’s yellow shirt and then he disappears. At the 2nd mile, I’m averaging 7:30. Staying steady! Further down Oak, houses line the street. It’s so neat to see people come out of their homes on a cold morning like this to cheer for all of us. I am following a girl in a bright orange tank top. There is a hound dog howling at us. Reminds me of Oscar’s howl. At the 3rd mile, I’m averaging 7:27. The miles are going by fast thankfully. I can hear a roar of people cheering up ahead. Sounds like a football game! I see a bunch of cheerleaders and lots of spectators. This is a boost! The girl in the orange tank has pulled away but I can still see her. I’m going to try to catch her by the time I get to the exchange. My head is feeling toasty! I pull my beanie off my ears to let off some heat. So weird that other parts of me like my hands are cold. At the 4th Mile, I’m averaging 7:26. Glad that I am able to pick it up. I know that the old relay exchange just after mile 5 is coming up. I’m over the halfway point now. A young girl in black flys past me. I look down and see a timing chip on her ankle…relay! Only us relay folks have those timing chips. I actually am still getting past by some marathoners though. That’s impressive! 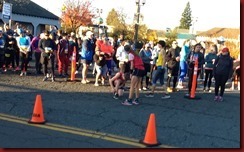 I start to get serious about catching the girl in orange and push harder. At the 5th Mile, I’m averageing 7:25. I’m feeling good but ready to wrap things up the in the next 2 miles. I am getting closer to the girl in orange. Another girl in a bright pink tank goes by, a marathoner. 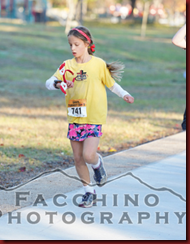 Wow, I cannot match her pace but try to let her pull me to a faster pace. I see the big 90 degree turn in the road ahead and recognize the old relay exchange spot. Yay! Getting closer! There is a huge wall of people here. It’s cool and gets me pumped up! At the 6th Mile I’m averageing 7:24. Troy and Anna must be close to finishing. Hope they’ve been able to run together! Getting closer to the girl in orange but she seems to allude me still! At the 7th Mile I’m averaging 7:23. I can see the relay exchange…yay! I almost caught up to the girl in orange…close enough. I surge and look for Liesbeth. There she is! We make a pretty quick exchange dispite the timing chip falling off the band. She throws me some clothes and she’s off. Go Liesbeth! Time to find Anna and find out how she did! Thanksgiving Day. The rain has let up. Our whole family is going to do (attempt) the 5k. We gather at our downtown square. Robin & I, Anna & Ariel, Dad and Oscar. Nice volunteers take our donations to “Stock the Closet” and give Oscar a dog treat in return. We catch up with some friends and Oscar meets some other dogs. We a lap around downtown to warm up. Oscar probably needs another 5 mi to get the anxiety out of him. He’s very excited. It’s a big turn-out with many dogs. Go! I’m nervous of Oscar tripping anyone so keep a close eye at the start. In doing so, I barely avoid hitting the photographer standing in the middle. Whew. Up Lincoln Ave, I see Anna and her friend, Leah, leading the race. Then Bailey. Then Oscar and I. We had Dad start 20 min early. I see him just beyond the Cherry Ave turn and call to him to insure he knows the course. Good, he’s going the right direction. Up the steep hill. Oscar isn’t following the plan of staying beside me so I pull-over to “re-emphasize” the importance of that. In the process, he gets out of his collar and now we have to put it back on. This sets us back in the race but we push hard and regain our position at the top of the hill. I’m huffing and puffing but that’s ok, only makes me stronger. Bailey looks at me very calmly. She just got back from the National College Cross-Country Championships. She’s not even breathing, the exact opposite of me. Long downhill on Finley. Oscar still hasn’t calmed down and twice runs to the opposite side of a pole so both of us get pulled to a halt by the leash. Back on High St, Bailey and the girls lead on the rt side of the street while about 4 of us follow on the left side. This is a “free” race so it’s up to everone to monitor traffic themselves and watch for cars. We did pray at the start that no one would get hurt. I hope my concerns always lead me to reliance on God. Mile 1: 7:02. We start up Pleasant Ave climb and, after stopping again for Oscar, I make it a goal to catch up to Baily and the girls. We cross the train tracks, go by Overlook Park and then by Railhead Park. Mile 2: 7:01. They’re still 20 steps ahead as we start down Sacramento st. Oscar is getting into the running groove now, calming down probably because there aren’t many other runners around. It’s fun running through our town. We’re careful going through the intersections. I’ve been keeping an eye on Anna and Leah to help insure their safe running. 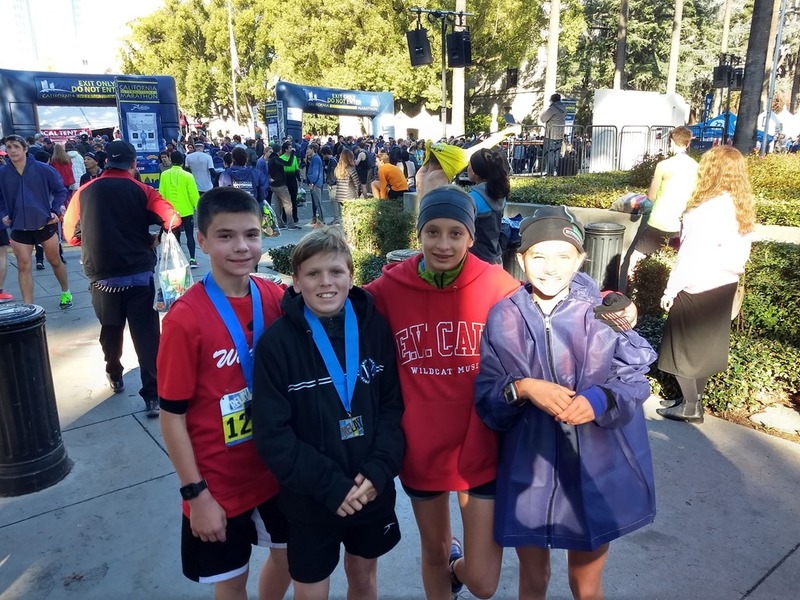 They wanted to do 6:40 pace, which is pretty fast, and I’m impressed with their smart running. As we approach the Courthouse and a Rt turn on Lincoln Ave, I make a move and sprint up to them. In front of the police station we’re all running abreast on the street and sidewalk. Anna says something nice encouraging me. She may think I’m going to win, but I’m pretty sure her sprint at the end is no match. Mile 3: 6:32. At the top, crossing Oakwood Dr., Bailey tell the girls to go for it. Sure enough they both put on a sprint that Oscar and I can’t keep up with.. actually Oscar could, but he’s forced to stay back with me. Anna & Leah finish first, holding hands. Bailey continues on to do the course again. And Oscar and I are glad to finish right behind them. Robin came in soon after and then Ariel came in with a surprising PR of almost 28 min! My Dad did almost a mile of the course and had a good time. Thank you, Lord, for a good time had by all. This is the first time that Pappy/Al has joined us on one of our racing adventures. We send him off before the race starts onto the course. This is a really low key setting and there are a lot of people. Fun! We line up on an imaginary start line. Ready, set, go! Up Lincoln Way and past Victory Velo bike shop. This is my first race since July 4th and my body feels unaccustomed to it. Anna and Leah have taken off. I can still see Troy and Oscar. We turn and head up steep Cherry Ave. I look to my right and see Ariel keeping pace with me. “Great job, Ariel! Pace yourself”. I expect her to slow down on the way up but she keeps pace with me! I push down Finley and past the track. I pull away from Ariel and shout back “free speed down the hill”. I’m averaging about 7:41 pace at the first mile as I pass Taco Tree. Another climb up Pleasant along the edge of the fairgrounds. Hope to head there tomorrow to get our tree. I can no longer see Anna, Leah or Troy. I lament a bit about Anna growing up so fast, and to be as fast. Maybe I can still take her in a marathon. There are some young boys probably about Ariel’s age ahead of me. I work to catch them. I pass Overlook Park and pass one of the boys. On to Railhead. Mile 2, yay, almost done! I’m averaging 7:45. The hills are pretty much done so I try to push all the way home. I catch up to the last 2 boys ahead of me and pass them. I tell them less than a mile and they are surprised. “Really? Cool!”. I have a feeling they will come back strong once we are closer to the finish. At the final turn back onto Lincoln Way, the boys are back. I encourage them to run their hardest down the hill to the Christmas Tree/Finish. I push, too, and see Anna and Leah cheering. I finish with a 7:35 average. Not my best but I’ll take it! I tell the boys “I hope you guys run cross country because you are fast!” They say they do. Great! Here comes Ariel! She’s smiling and proud. Fun day for the Soares family! Go!!! Leah and I take off. We try to stay an even pace. We start to run up to where Victory Velo is. There are young kids in front of us, but I know we will catch up to them. Once we get to Victory Velo we turn to run up Cherry Street. While running up Cherry Street, I try to go easy to keep my legs fresh. A guy catches up to Leah and I on Cherry. I don’t mind. When we got to the top we start running downhill. I notice that my shoe lace is untied. I hand Leah my gloves I’m wearing and stop to tie my shoe. I tell Leah to keep the pace. I run after her and reunite with her. Leah and I are now leading the race all by ourselves. I am glad my dad had told me the race course so that we don’t lead everybody the wrong way. As we turn on to High Street I hear Bailey Cossentine start to run up behind us. We stay ahead of her all the way to Railhead Park. She is doing the 10k, so she isn’t our competition. We run together and she helps us out. We are just about to turn on to Sacramento Street, when I hear my Dad and Oscar catching up. He runs behind us as we run towards 7-11. We pass 7-11 and start to run right by the Barnhart Museum. As we are running by the white fence, I see a guy taking photos. I later find out it was the newspaper guy taking photos. We keep running. I see up in the distance the courthouse building. As we run past the building, my Dad starts to pass us. It’s the long uphill which then leads to the downhill into downtown. Leah and I start to pick it up. My legs hurt really bad. I know that I won’t be upset if my Dad beats me. As we near the top of the hill I can see the downhill. I know I have a good sprint. Leah and I start to sprint down the hill passing my Dad. My Dad says to cross the road and we cross over and finish. I finish hand in hand with Leah. God let that race be great. I do know that it was difficult for my Dad to run with Oscar in a race. So he could have gone faster. But at least I am glad I beat him in this race. 3, 2, 1, go! There are a lot of people. I start running. I am able to catch up with my Mom. We pass Victory Velo bike shop and turn by Monkey Cat Restaurant. Up ahead my Dad is calling to my Grandfather (Pappy) where to go. Then my Mom does the same. “Pappy this way! Follow the runners!” yells my Mom. I am staying with my Mom. Then we start up a hill. “go Ariel don’t waste your energy! Good job! You’re doing great! Your doing so well” called Mom. I pass one girl that looks my age. I get up the hill. I start going down the hill. My Mom is getting farther and farther away. A girl with a dog passes me. I want to stay with her. In my head I make a new goal. The goal is to stay close to her or stay ahead of her. We run the way that Mommy, Anna, and I would drive to track. Then we get to the main street and pass Placer High. We run some more. We turn by State Farm on Pleasant Ave. We run straight and uphill. I am still behind the girl with the dog. I pass a boy that looks my age. We run straight for a long time. I pass the fair grounds. Then across the train tracks. Then more straight roads. It is nice that there aren’t a lot of hills. I’m enjoying the straightness. We start up another hill and it isn’t so bad. I pass a girl that looks a little older than me. We pass the Overlook Park. I’m trying to pass that girl. Finally, I pass her. I run down the hill I start smelling smoke. It goes away and then comes back. There is a soccer game going on. I’m running past Railhead Park. I turn then I run past the new homes. I keep running straight. Then I cross railroad tracks. I keep running straight then I turn. Across the street. Past 7-11 and then past the Fairgrounds opening and the Barnhart Museum. Across the street again. I’m running straight and I’m starting to hurt a lot. I hear a dog leash behind me. Oh no, hope its not the girl who I’m trying to stay ahead I’m thinking in my head. The sound isn’t loud. I look behind me and see her coming. I run faster. I turn, go uphill a little, and, as I go down, I hear something that sounds like someone is running in flipflops. I look behind me fast and all I see is a blur. I think it’s a boy. He is trying to pass me. I see the finish. 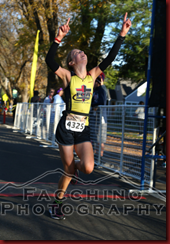 I sprint in to the finish. All done! We adopted Oscar, a German Shepherd / Hound mix, from the late Carl Johnson who was a great ultra-runner. Oscar is good dog who loves to run as a result of the many training outings with Carl. We’ve been taking him on more runs with other people to calm him down in a crowd. A few months ago Anna ran a 5k here with Oscar but all he wanted to do was catch up to the leaders. So we’ve been training him to stay back and run as a team, not as a lone wolf. Hopefully today he’ll hang back and remember we aren’t as fast as him. It’s a great group with all shapes and sizes of dogs. This is really fun. Dogs are sniffing each other and getting some great social time. But now it’s time to run. Anna and I pray beforehand. Racing is a privilege granted by God and we want to glorify Him with it. Go! Owners and dogs sprinting down the beach access road. One lady, ahead of us in 2nd, flying along with her short little dog suddenly has to pull over and drop back . Her dog just had to go, race or no race. I hope Oscar waits till after the race.. So now we’re near the front, running through the trails. Mile 1: 6:55. Oscar is being pretty good but I have to call “heal!” a number of times. A few times I have to reach down to pinch him to remind him to run together, not out in front. Anna was right with us but has dropped back a little bit. It’s a fast pace and everything is going well. No wrong turns, no obstructions, no tripping over each other. Oscar is having a great time as he jogs along effortlessly while my heart rate is sky-high. At the farthest point there is a kiddie pool for dogs to drink and an aid station for humans. We grab water but Oscar is only concerned about getting to the finish first. We’re still a few steps ahead of Anna and close to the finish. There are still some dogs we are passing from the earlier 10k race. But now we’re at the finish and Oscar calmly strides across as I feel a great relief to be done (and that the course was a little short). Thanks Oscar for getting me to run a fast 5k. Good dog! I stand at the race ready to start. As the announcer counts down, I get ready to run. He says go and I take off. 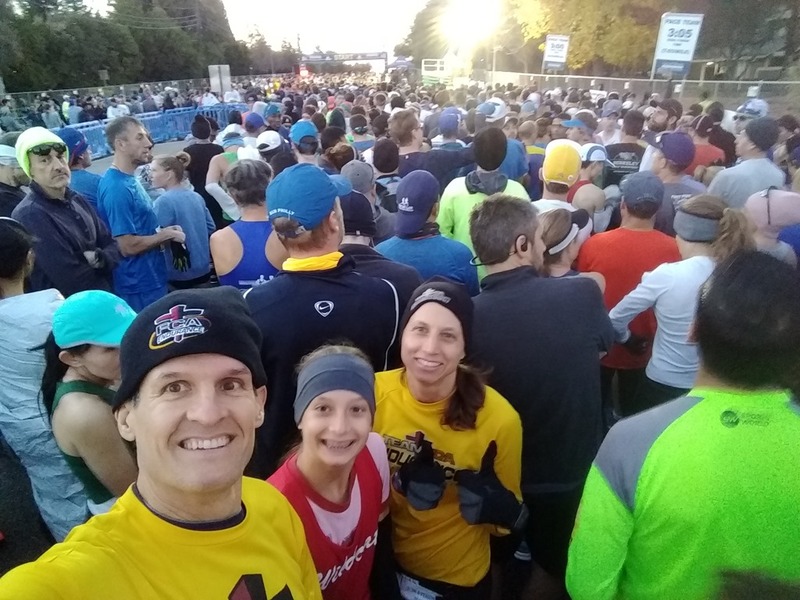 I am running with my Dad and we are close to the front. In front of us is a girl and her dog. As we are running the girl’s dog, in front of us, all of the sudden starts going to the bathroom while running about 6:00 min pace. He’s leaving a line of turds behind him. My dad, Oscar and I keep running to the trails. We run zigzags up and down for about .2 miles then hit the road. We start to run up the road and then turn onto a levee. As we run across it, I can see the finish area and the parking lot. When we get to the end of the levee, I grab some water at the aid station. We hit another trail and I can’t believe my dad is keeping this pace. I try to stay with him. We run over sticks and sand, it isn’t wet like the last time I ran here. We run to a road and run down it for about .1 miles. There is an aid station at the very end of the road but my Dad and I both don’t grab any water because we were over half way there. The only problem is that my hamstrings are tight and I can feel them as I run. Also, my nose is really runny which makes me have to wipe my nose a lot.I follow my dad up in front of as we approach a turn. As my Dad turns up ahead of me, he knocks down a cone. I pick it up for him and keep running. When going up the hill, it is hard with the sand. I try to run flat footed but that doesn’t help much. Plus, my hamstrings are hurting like crazy. I don’t walk but I slow down a little bit. I almost want to cry but smile and keep a good attitude for my Dad and God. As I am running down the hill, my hamstrings still hurt but not as much as going upward. I run around a bend and my Dad encourages me from up ahead. He has a good lead and is going strong. I know I’m not going to catch him but I don’t slow down. I get to a flat spot and see a guy with his dog up ahead. I pass him and keep running on the trails. I turn the bend and see my Dad up ahead turning the bend. My Mom and sister cheer me on as I get closer to them. By the time I reach them, my dad has already finished. I turn the last bend and the announcer is at the corner ahead and he thinks my name is Ariel and I give him a friendly stink eye and he says Anna. I nod my head to let him know he’s correct. I turn the bend and the finish line is right there I sprint in and get my medal. I give dad a hug. 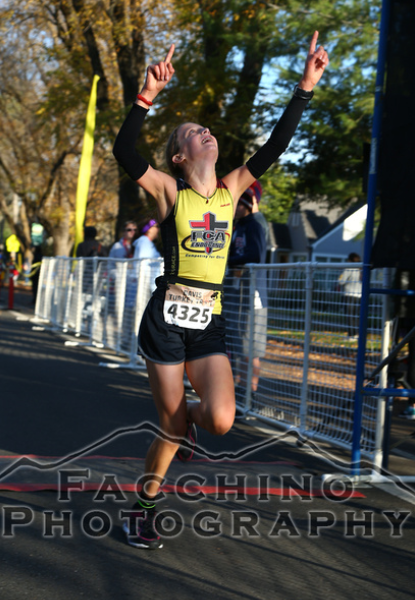 God blessed the race even though my hamstrings hurt. Praise the Lord for He is good, His love endures forever.